Your browser doesn’t support HTML5 video in WebM with VP9 or MP4 with H.264. You can open the Shortcuts app and select Scan Book to Zotero. You can swipe right from the lock screen or home screen to open the Today View and select Scan Book to Zotero in the Shortcuts widget. If the Shortcuts widget doesn’t appear or doesn’t appear where you want it, you can add or move it via the Edit button at the bottom. If you have an iPhone that supports 3D Touch, you can hard-press on the Shortcuts app icon and select Scan Book to Zotero from the widget popup. You can say something like “Hey Siri, add this book to Zotero”. (Maybe don’t use this one in the library.) To set a phrase for Siri, open the Shortcuts app, tap the three dots in the Scan Book to Zotero rectangle, tap the settings icon in the top right, and then tap Add to Siri and assign a phrase. In our testing, we found Siri support to still be a bit buggy in the current version of Shortcuts, so if Siri doesn’t recognize your phrase, try editing the shortcut and re-recording the phrase or wait for an update from Apple. P.S. 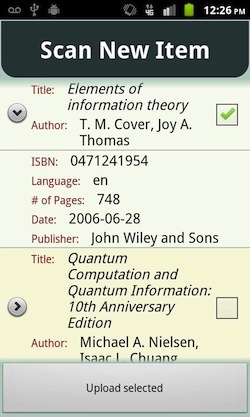 If you don’t use an iPhone or iPad, or you can’t upgrade to iOS 12, you can still save a book from your phone when you’re away from your computer by entering the ISBN manually. 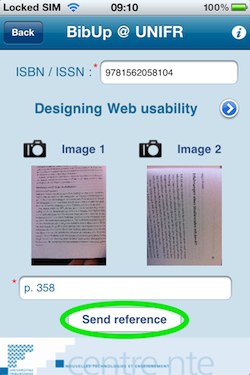 Simply bookmark this page and load it whenever you need to add a physical book. Zotero 4.0.27, now available, brings some major new features, as well as many other improvements and bug fixes. In Zotero for Firefox, it’s now easier than ever to save items from webpages. Zotero senses information on webpages through bits of code called site translators, which work with most library catalogs, popular websites such as Amazon and the New York Times, and many gated databases. If Zotero detected a reference on a webpage, you could click an icon in the address bar — for example, a book icon on Amazon or a journal article icon on a publisher’s site — to save high-quality metadata for the reference to your Zotero library. If a site wasn’t supported or a site translator wasn’t working, you could still save any webpage to your Zotero library by clicking the “Create Web Page Item from Current Page” button in the Zotero for Firefox toolbar or by right-clicking on the page background and choosing “Save Page to Zotero”. In such cases, you might need to fill in some details that Zotero couldn’t automatically detect. In Zotero 4.0.27, we’ve combined the address bar icon and the “Create Web Page Item from Current Page” button into a single save button in the Firefox toolbar, next to the existing Z button for opening the Zotero pane. You can click the new save button on any webpage to create an item in your Zotero library, and Zotero will automatically use the best available method for saving data. If a translator is available, you’ll get high-quality metadata; if not, you’ll get basic info such as title, access date, and URL, and you can edit the saved item to add additional information from the webpage. The icon will still update to show you what Zotero found on the page, and, as before, you can hover over it to see which translator, if any, will be used. This also means that a single shortcut key — Cmd+Shift+S (Mac) or Ctrl+Shift+S (Windows/Linux) by default — can be used to save from any webpage. The new save button also features a drop-down menu for accessing additional functionality, such as choosing a non-default translator or looking up a reference in your local (physical) library without even saving it to Zotero. (This functionality was previously available by right-clicking on the address bar icon, though if you knew that, you surely qualify for some sort of prize.) The new menu will be used for more functionality in the future, so stay tuned. Prefer another layout? In addition to the new combined toolbar buttons, Zotero provides separate buttons for opening Zotero and saving sources that can be added using Firefox’s Customize mode. While all the above changes apply only to Zotero for Firefox for now, similar changes will come to the Chrome and Safari connectors for Zotero Standalone users in a future version. For now, Zotero Standalone users can continue to use the address bar (Chrome) or toolbar (Safari) icon to save recognized webpages and right-click (control-click on Macs) on the page background and choose “Save Page to Zotero” to save basic info for any other page. Making Zotero accessible to users around the world has always been a priority. Thanks to a global community of volunteers in the Zotero and Citation Style Language (CSL) projects, you can use the Zotero interface and also generate citations in dozens of different languages. Now, thanks to community developers Rintze Zelle and Aurimas Vinckevicius, it’s much easier to switch between different languages when generating citations. Previously, Zotero would automatically use the language of the Zotero user interface — generally the language of either Firefox or the operating system — when generating citations. While you’ve always been able to generate citations using a different language, doing so required changing a hidden preference. You can now set the bibliography language at the same time you choose a citation style, whether you’re using Quick Copy, Create Bibliography from Selected Items, or the word processor plugins. In the above example, even though the user interface is in English, the default Quick Copy language is being set to French. If an item is then dragged from Zotero into a text field, the resulting citation will be in French, using French terms instead of English ones (e.g., “édité par” instead of “edited by”). The new language selector is even more powerful when using the word processor plugins. The bibliography language chosen for a document is stored in the document preferences, allowing you to use different languages in different documents — say, U.S. English for a document you’re submitting to an American journal and Japanese for a paper for a conference in Japan. Note that, of the thousands of CSL styles that Zotero supports, not all can be localized. If a journal or style guide calls for a specific language, the language drop-down will be disabled and citations will always be generated using the required language. For example, selecting the Nature style will cause Zotero to use the “English (UK)” locale in all cases, as is required by Nature’s style guide. Zotero now offers an “Export Library…” option for group libraries, allowing the full collection hierarchy to be easily exported. If you find yourself facing many sync conflicts, you can now choose to resolve all conflicts with changes from one side or the other. For Zotero Standalone users, we’ve improved support for saving attachments from Chrome and Safari on many sites, bringing site compatibility closer to that of Zotero for Firefox. And we’ve resolved various issues that were preventing complete syncs for some people. There’s too much else to discuss here, but see the changelog for the full list of changes. If you’re already using Zotero, your copy of Zotero should update to the new version automatically, or you can update manually from the Firefox Add-ons pane or by selecting the “Check for Updates” menu option in Zotero Standalone. If you’re not yet using Zotero, try it out today. 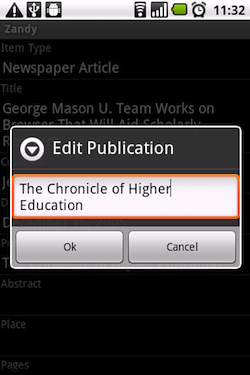 Zandy is well on its way to being the first full-featured mobile Zotero application for Android devices. Users can currently edit and view their Zotero libraries, add new items, and work offline. Future releases promise even more functionality. 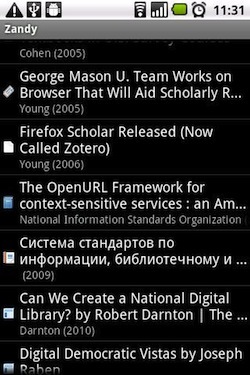 Scanner for Zotero lets you add books to your Zotero library from anywhere, with no need to have Zotero installed anywhere. 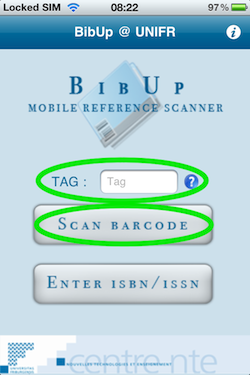 Simply scan a book’s ISBN barcode with your Android phone, and the software will add the book to your Zotero library directly on our servers. 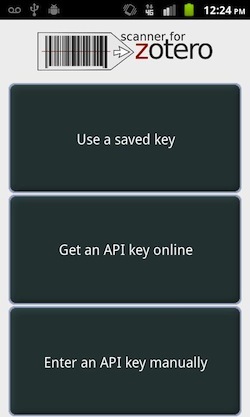 BibUp allows iPhone users to add books to their Zotero libraries much like Scanner for Zotero, and it also provides the additional functionality of photographing specific pages to be collected, on which BibUp will even perform OCR. 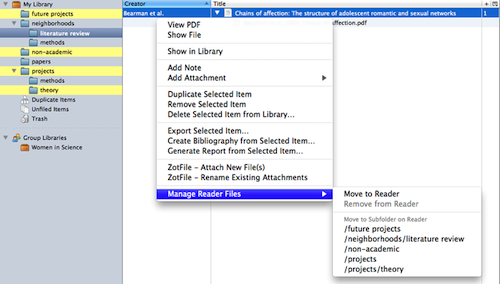 ZotFile Reader eases the transfer of Zotero-based PDFs to and from mobile readers like Android devices and the iPad. It builds on the success of the original ZotFile extension, which significantly enhances Zotero’s built-in PDF management by automating the attachment of PDFs to Zotero items, and the renaming of those files according to user-configurable rules. The latest beta version of ZotFile combines all of this functionality into a single extension. As amazing as these projects are, the traffic on the Zotero developers mailing list suggests that we can expect even more exciting developments in the near future!